Franz Schwarz delivered the 4th Bergsten Lecture on the subject of “Systemic Case Management and Burden of Proof”. Over 400 registered attendees, including senior members of the Austrian and German judiciary and academia, followed the invitation of the Austrian Arbitration Association and the Vienna University School of Law, who co-hosted the event at the premises of the Vienna International Arbitral Center. In his lecture, Mr Schwarz encouraged a deeper, more 'systemic' consideration of how substantive law interacts with procedural issues, exploring the interdependence of substance and procedure on the example of burden of proof and document disclosure. Should a party be only entitled to request documents from the other side with respects to facts for which it carries the burden of proof (as the majority of civil law authorities suggests)? Or should document production requests be considered, and granted, independently from the burden of proof (as argued predominantly by common law scholars and tribunals)? In considering these questions, Mr Schwarz first charted the fundamentally different qualifications, in the polar opposite jurisdictions of Germany and the United States, of burden of proof concepts as principally procedural (common law) and substantive (civil law). Despite these different qualifications, however, both systems are concerned with creating a level playing field between litigants: while common law jurisdictions do so by permitting disclosure of documents controlled by the opponent and thus giving both parties equal access to the available evidence, civil law jurisdictions create equality between the litigants through (sometimes complex) rules on reversing the burden of proof or by operating certain presumptions against the party in the stronger (evidentiary) position. In the circumstances, document production in international arbitration faces a systemic issue: from the perspective of civil law jurisdictions, when arbitration indiscriminately allows for document production, it employs an instrument that is not only systemically alien but that potentially interferes with long-established rules of proof embedded in substantive law. In proposing a solution, Mr Schwarz drew on several important arbitral principles: (i) the procedural flexibility of the arbitral process uniquely suited to resolve tensions between substance and procedure; (ii) the principle of party autonomy which requires that the parties' choice of substantive law be given effect; and (iii) the principle of equality which is inherent in both the common-law disclosure process and substantive burden of proof rules in civil law jurisdictions. On that basis, Mr Schwarz rejected the notion that burden of proof rules are entirely detached from document disclosure but instead called for an assessment, in the individual case, of how the objectives and policy goals of the applicable substantive law can be best mirrored in, and given effect by, document production processes. For example, where the applicable substantive law reverses the burden of proof onto the opponent, precisely because the opponent is 'closer' to the evidence, it would be systemically correct not to order document production but instead to enforce the substantive burden of proof rule (and indeed any heightened evidentiary standard) against the party in possession of the documents. It would be equally coherent in such circumstances, however, to allow document production requests between the parties—but this would then also require reconsidering the evidentiary value judgment imposed by substantive law: through document production, one party is no longer disadvantaged in its access to the evidence, and ought therefore not benefit from evidentiary rules designed to address that disadvantage. After discussing several other examples, Mr Schwarz also addressed the situation in which the substantive law did not provide a specific rule deviating from the typical distribution between claimant and respondent. In that case, he argued for allowing document production as the best possible practice ensuring equal access to the evidence and fair and effective decision making. The lecture was followed by a debate chaired by the Dean of Vienna University School of Law, Professor Dr Paul Oberhammer between Professor Dr Istvan Varga (University of Budapest), Dr Gerold Zeiler (of Zeiler & Partners in Vienna) and the audience. A shortened video recording of the lecture can be accessed here. The full lecture, as well as the debate, will be available shortly on the website of the Austrian Arbitration Association. The Bergsten Lecture was installed to recognize and honor the achievements of Professor Eric Bergsten, former Secretary General of UNCITRAL and founder of the VIS International Arbitration Moot in Vienna. Previous speakers were Nathalie Voser, Alexis Mourre and John Beechey. 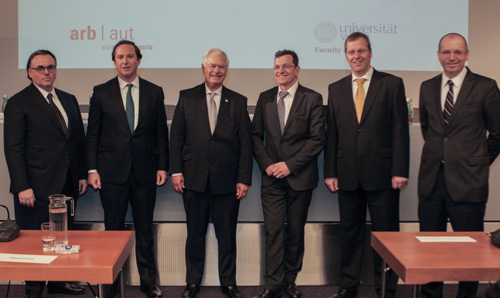 From left: Professor Paul Oberhammer (Dean), Franz Schwarz, Professor Eric Bergsten, Christian Klausegger (President ArbAut), Professor Istvan Varga and Gerold Zeiler.